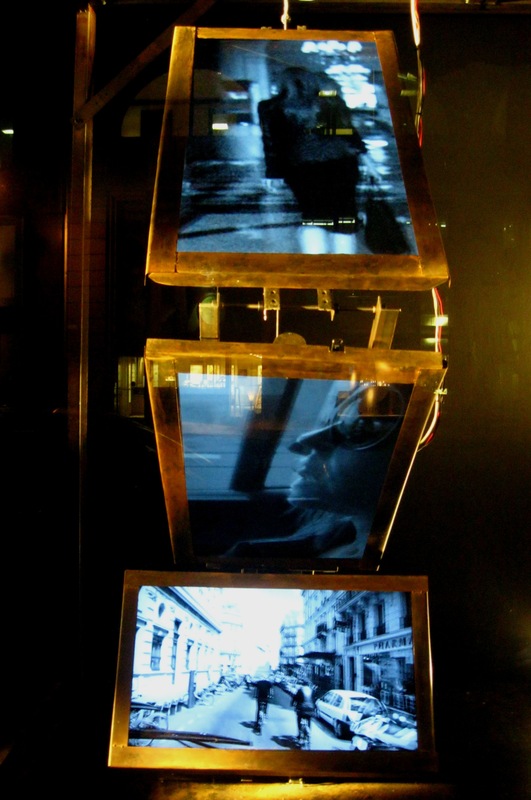 On the very first Fashion’s Night Out I was still living in Paris and went by avenue Montaigne to see what it was all about. Alas, the atmosphere was so dreadfully snobbish I bailed out. See, this is the thing that I love about New York: such events are much more accessible, you can easily mingle with people you admire and in this case they take place all over the city, not in one street only. 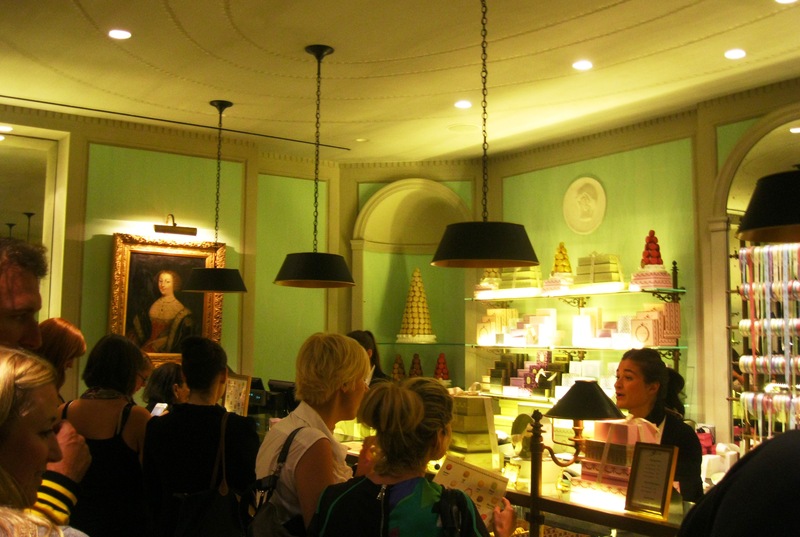 And FNO was also a good excuse to visit to the newly-opened first-ever Ladurée store in the USA! As soon as I got out of the office I headed towards Saks Fifth Avenue hoping I could meet actress Tilda Swinton. Instead, I saw three of the gorgeous women representing Estée Lauder: French model Constance Jablonski, Liu Wen and Joan Smalls. 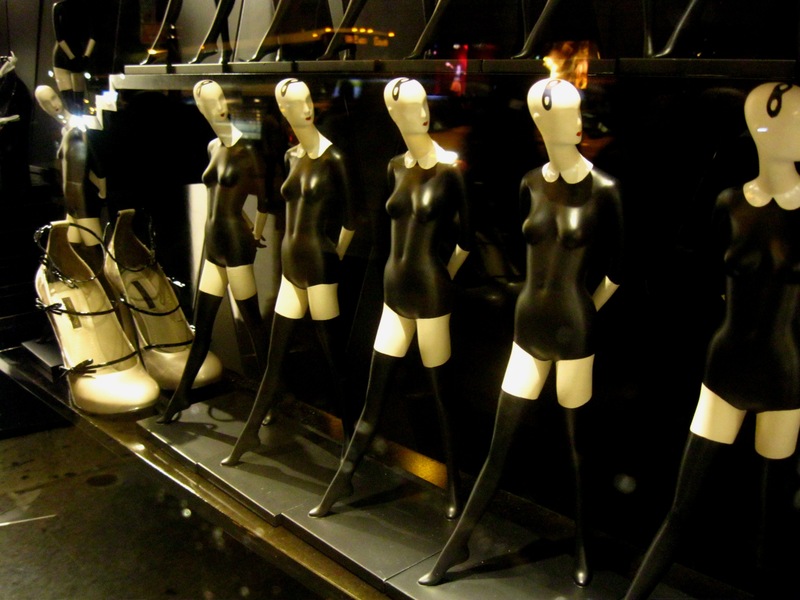 I then walked up 5th Avenue to see the new Louis Vuitton windows: the maids from the fall-winter 2011 show have replaced my beloved ostriches. To get over it, I indulged in an exquisite glass of wine at the Caudalie Spa. Next stop: the Calvin Klein store on Madison Avenue. I was looking at pictures of the brand’s face Lara Stone when I noticed her standing right next to me. Imagine my surprise! Her shy demeanor and sweet smile contrasted deeply with the femme fatale she usually embodies. 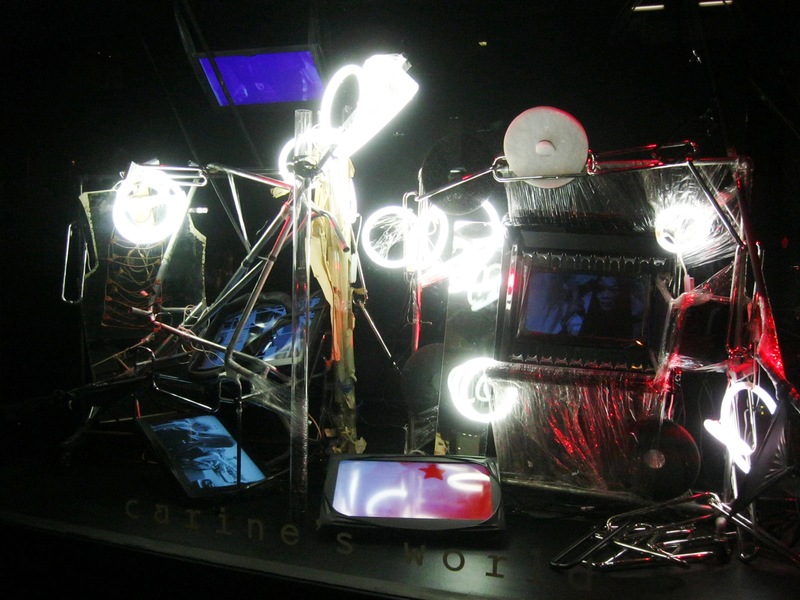 Further up on Madison, Barneys had finally revealed their new windows celebrating Carine’s World, their collaboration with Carine Roitfeld. No clothing to be found here, only videos by Mario Sorrenti in which the ex-Vogue Paris editor in chief is seen talking (barely audibly) about her career and walking through Paris. Quite disappointing really. 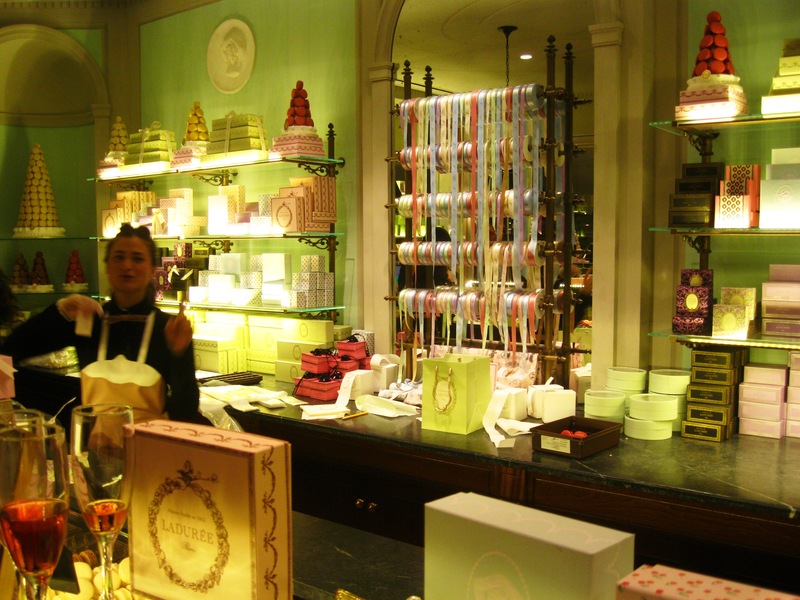 One ice tea at Chanel and one dance competition at Lanvin later, I arrived at my secret destination of the night: Ladurée! Located on Madison Avenue between 70th and 71st Streets, it is next to the highly-awaited future Céline store. You have no idea how happy I was to find this little bit of Paris in New York. The ribbons, pastel colors, little boxes and the retro refined charm of the place took me back to the French city in a heartbeat. The store only sells macarons and none of the gorgeous pastries I showed you here. But I forgive Ladurée: their New-York macarons are absolutely divine. They melt in your mouth and their subtle taste is enchanting. I found them even better than in France and than my usual favorite Pierre Hermé! The cinnamon-raisin macaron that was created specially for Fashion’s Night Out was particularly exquisite. 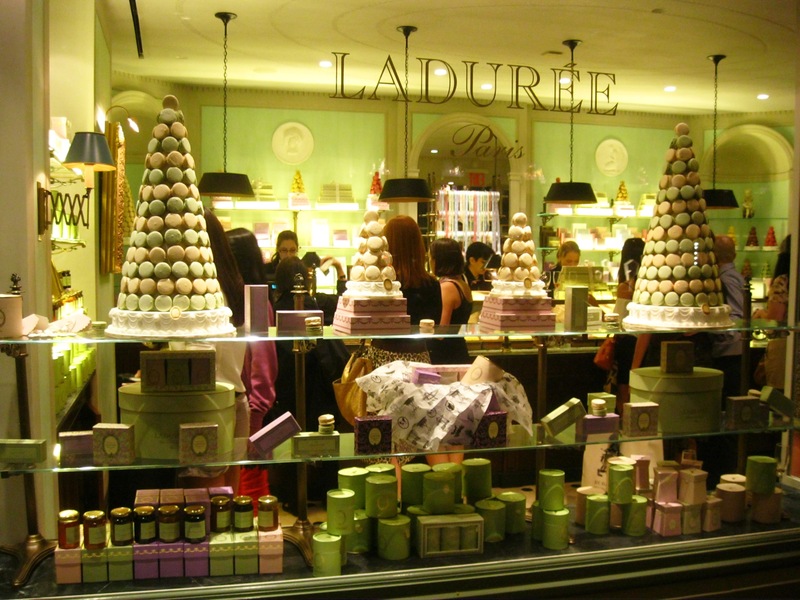 A second Ladurée store with a restaurant should open in New York by April 2012 in Soho. I shared my first Ladurée macarons from New York with my friend Sarah from Style on the Couch over dinner at her East Village apartment. The perfect way to end the night! And you, how did you celebrate Fashion’s Night Out? J’étais passée avenue Montaigne pour la toute première édition de la Fashion’s Night Out. Hélas, l’atmosphère snobissime m’avait fait fuir. A New York, je n’ai pas du tout eu ce sentiment : des événements beaucoup plus « accessibles » se déroulaient dans toute la ville. Et cette nuit était l’occasion de me rendre au premier magasin Ladurée des Etats-Unis tout fraîchement ouvert ! Dès ma sortie du bureau je suis allée au grand magasin Saks 5th Avenue dans l’espoir de rencontrer l’actrice Tilda Swinton. A la place j’ai vu les égéries de la marque Estée Lauder : le mannequin français Constance Jablonski avec ses compères Liu Wen et Joan Smalls. 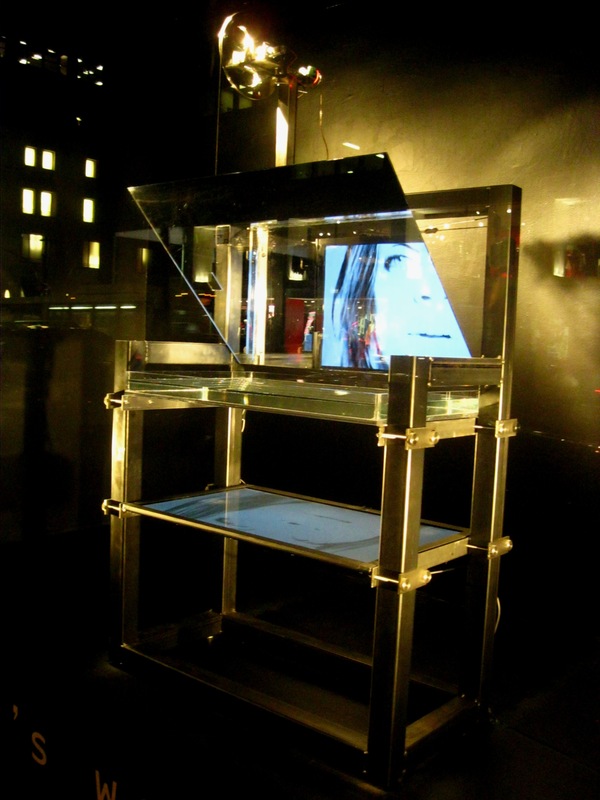 J’ai ensuite remonté la 5e Avenue pour voir les nouvelles vitrines Vuitton : les bonnes du défilé automne-hiver 2011 ont remplacé mes autruches adorées. Pour me remettre de mon chagrin, j’ai savouré un verre de vin exquis au spa Caudalie du Plaza. Etape suivante : la boutique Calvin Klein de Madison Avenue qui met à l’honneur son égérie Lara Stone. Quelle ne fut pas ma surprise de la retrouver en chair et en os juste à côté de moi ! Son air intimidé et son beau sourire contrastaient avec son image de femme fatale. 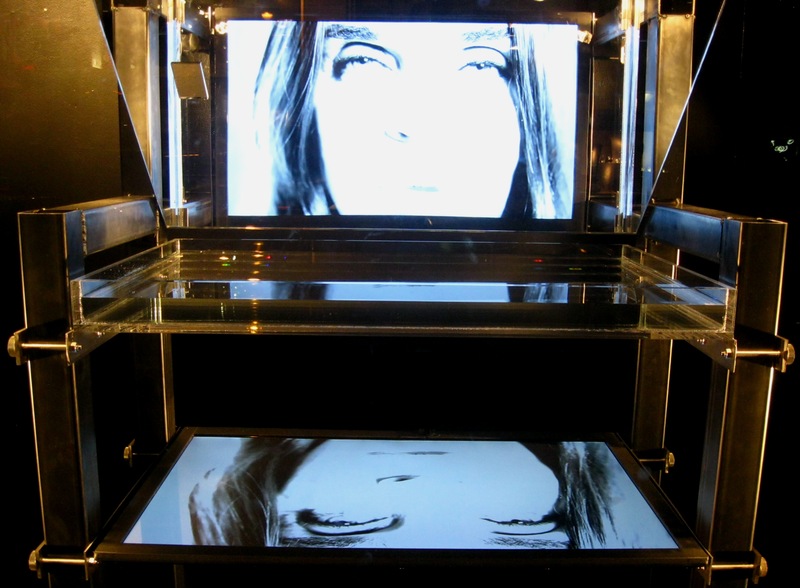 Un peu plus haut sur l’avenue, Barneys avait enfin mis en vitrine sa collaboration avec Carine Roitfeld. 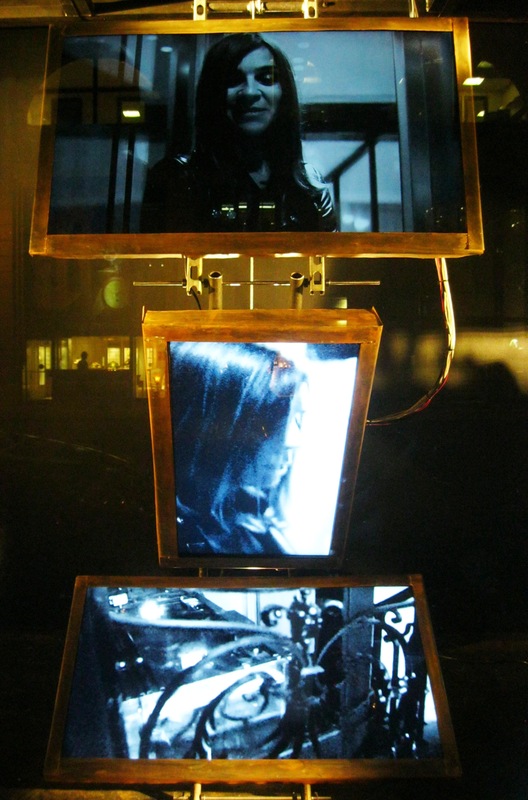 Aucun vêtement n’y figure, juste des installations vidéo comme cet étrange appareil montrant l’ex-rédactrice en chef de Vogue Paris parler de sa carrière et déambuler dans Paris. Assez décevant en fait. Un thé glacé chez Chanel et un concours de danse chez Lanvin plus tard, je me retrouvais au but secret de ma soirée : le tout nouveau magasin Ladurée ! Située sur Madison Avenue entre la 70e et la 71ème rue, il est voisin de la future boutique Céline. Quel bonheur de retrouver ce petit bout de Paris à New York ! Les rubans, les couleurs pastelles, les petites boîtes et le charme rétro et raffiné de la maison me ramènent tout de suite à la Ville des Lumières. La boutique ne vend que des macarons et pas les magnifiques pâtisseries que je vous avais montrées ici. Mais je pardonne Ladurée : les macarons new-yorkais sont absolument di-vins. Ils fondent dans la bouche et leur goût subtil m’enchante. Ils sont encore meilleurs qu’en France et que chez mon chouchou Pierre Hermé ! Le macaron cannelle-raisin créé tout spécialement pour la Fashion’s Night Out était particulièrement exquis. Une deuxième boutique avec restaurant devrait ouvrir à New York en avril 2012 dans le quartier de Soho. J’ai partagé mes premiers macarons Ladurée de New York avec mon amie Sarah de Style on the Couch lors d’un dîner improvisé dans son appartement du East Village. La parfaite conclusion à cette soirée ! Et vous, comment avez-vous fêté la Fashion’s Night Out ? Great blog :-) Although I dont understand the text, and only could look at the pictures. Wow, the Estée Lauder girls, Lara Stone, Carine Roitfeld, Chanel, Lanvin, Louis Vuitton, Ladurée ALL in one night? How wonderful! I need to go to New York soon! I left work late so I was afraid I had missed most of the events but overall I’m pretty pleased with my FNO. There was so much going on all over the city! C’est pas vrai – mieux que Pierre Hermes?? I have to stop by and visit then I suppose…great post, lovely photos! Yes!! Believe it or not: better than Pierre Hermé. Their flavors are not so bold but macarons melting in your mouth and sending you straight to heaven? Sign me up. 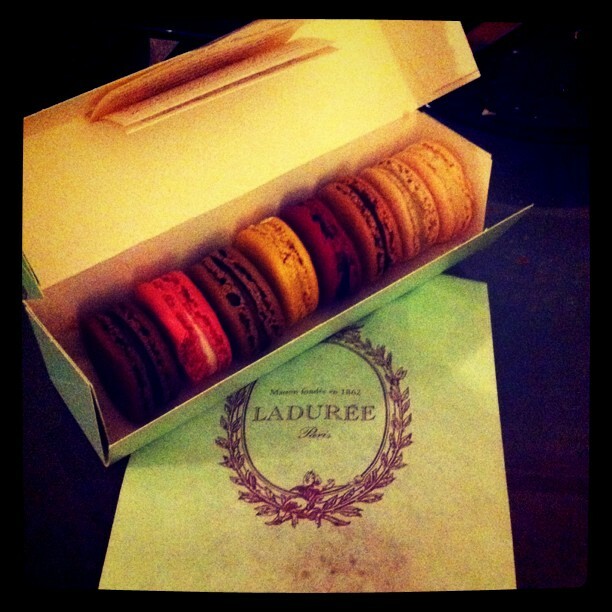 I’m so glad I got to go to the Ladurée store on that night and shared these macarons with you! For next year’s FNO I believe I’ll stay more Uptown as you have many luxury shops without the Midtown and Downtown crowds. Like you, too many people in stores and on sidewalks makes me want to leave ASAP! Joan Smalls? Liu Wen? Lara Stone? Who on earth are you woman? Anna Wintour!? Amazing! Lara Stone looks so much more beautiful when captured naturally. Joan is doing great things right now and pushing the boundaries without controversy. I guess she felt the need to get out of Paris after her stint at Vogue and it was probably easier and less awkward for her to work here anyway because of the Emmanuelle situation. 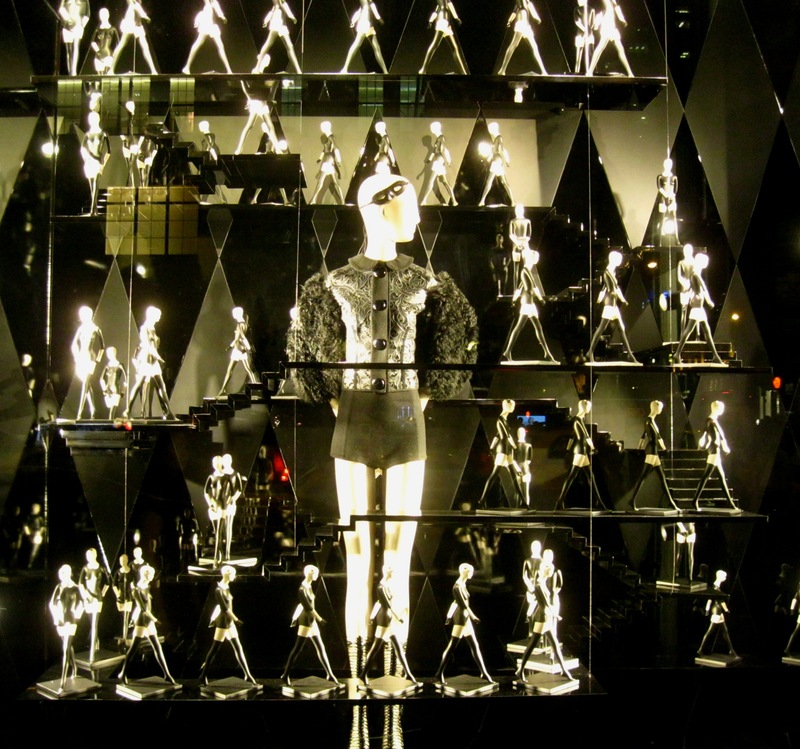 They made all this buzz about her at Barneys but the windows are so awful. I’m thinking that while I love her, so imagine the people who have no clue who she is. 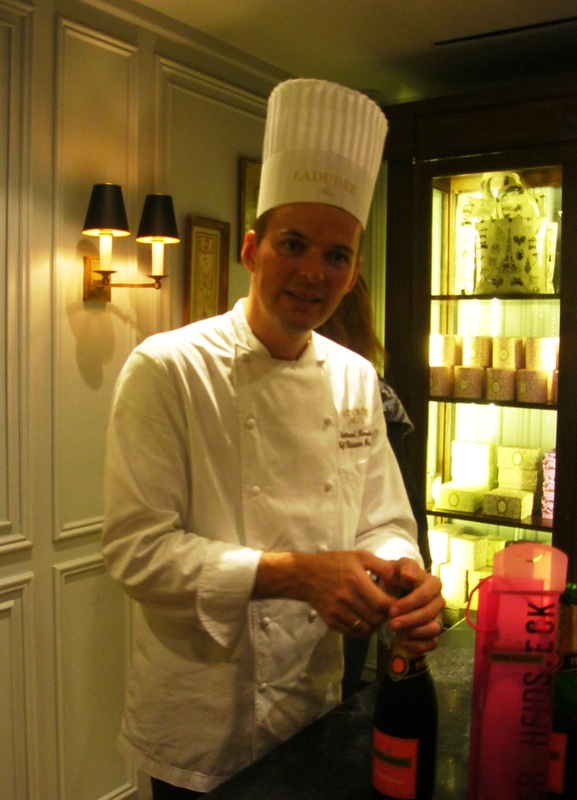 I’m surprised you enjoyed the Laduree macarons so much! I was very disappointed in mine- I went on the first day for them. They were either soggy or crumbly and no where near the delicious treats I enjoyed in Paris just a few months ago in April. My friend who went last week had the same response to them. They need to start making them here– there is stiff macaron competition in the city from Payard, Bisousciao and Macaron Cafe. If they do open a SoHo store I will expect them to have a stateside macaron kitchen. Being the best in Paris isn’t good enough to be the best in NYC! Thanks for your review! 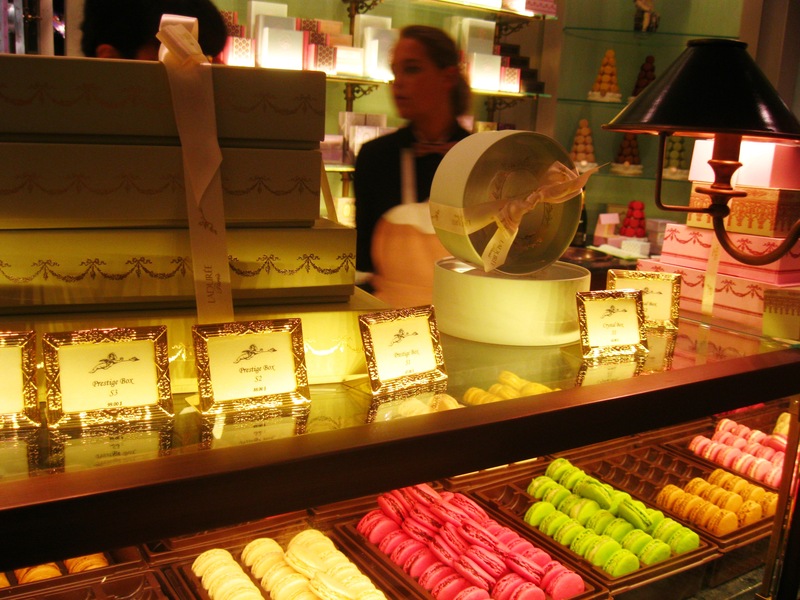 Yes, I’m surprised as well that we have such a different opinion on the macarons from the Ladurée store in New York. I went to Macaron Café yesterday and thought they were awful in comparison. Maybe I just happened to get an exceptionally good batch or our tastes in macarons are diametrically different ;-) I have yet to go to Bisousciao, thanks for the recommendation! Lara Stone is my favourite, most adored ‘contemporary’ model. Though I’m not sure whether my low self-esteem could cope to see perfection at such close quarters! Lara was incredibely beautiful indeed in person with that edge that makes her so interesting. She was so sweet, smiling and happy to pose with everyone that I’m sure she would have greeted you with open arms. Hi Molliee! Did you celebrate FNO on the West Coast? 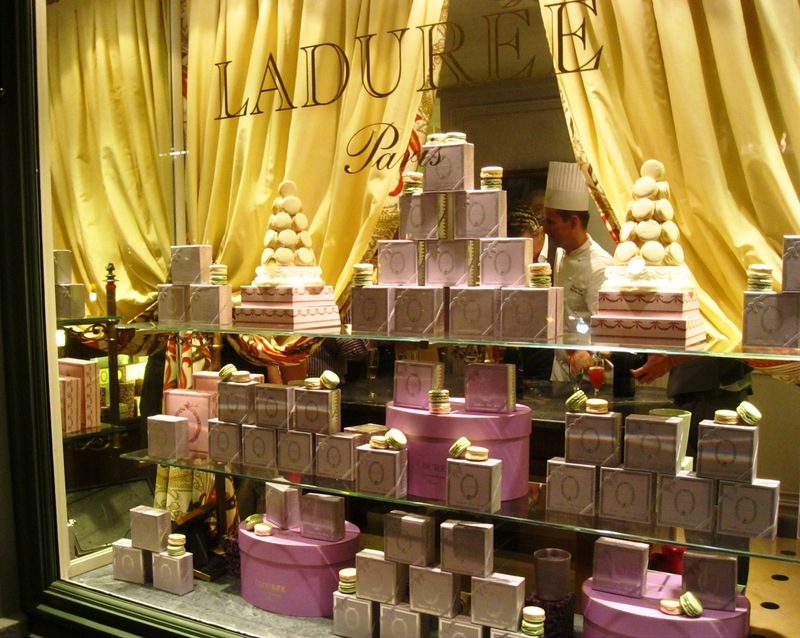 Oooh I MUST hit Laduree on my next NYC jaunt! I can not believe it myself, they were that good! Actually I was thinking of bringing you a box when I come to Boston. No worries at all for that night; I know you were tired from your travels. I’m sorry I couldn’t meet you Friday night: I left work at 8:30pm :-( and all I wanted to do was roll into bed. Ah the life of a fashionista / blogger!